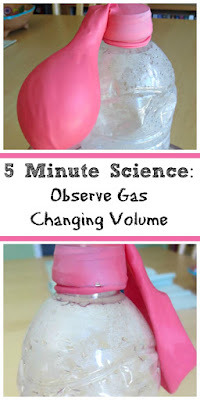 Help your kids “see” how air changes volume when temperature changes with this easy and quick science experiment. My daughter is 8 now and a “pro” when it comes to states of matter and properties of matter. She understands that all matter has mass and volume, but sometimes it’s difficult to visualize these concepts when it comes to gases. This experiment is designed to show how air changes volume when its temperature rises or falls. Our first attempt was to just set an empty bottle outside and see what happens – “slow turtle” approach. After 30 min of standing in the sun, our balloon inflated just a little bit, and I was worried that the sun will melt its rubber, so we moved to ‘'fast hare” approach. We plunged our water bottle into hot water (a little less than boiling hot, because plastic will deform in very hot water affecting an experiment) and watched balloon inflate as if by magic. Then we put our bottle into icy cold water and watched the balloon shrink entirely. I think results would be even more spectacular with a bigger 2L bottle of soda, but we didn’t have one on hand. Smarty was eager to explain this experiment herself: Molecules in gas move freely and try to fill all space available. When temperature rises, they move faster, and can go farther, so air expands and balloon inflates. When temperature drops, molecules slow down, and they get more attracted to each other, so balloon deflates. As you can see, it’s not “entirely” correct, since we didn’t really discuss pressure or Charles’ Law yet . This will come when she is a bit older. What kind of experiments have you done lately? 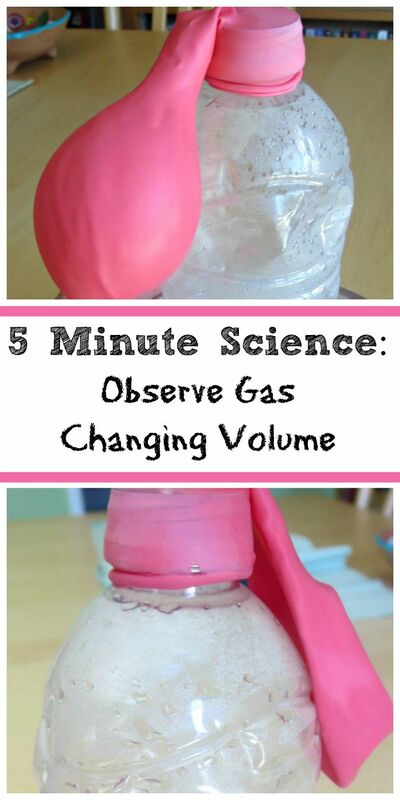 Follow my Science Pinterest board with round ups of science experiments and my States of Matter board with specific experiments on properties of matter. Follow Natalie Planet Smarty Pants's board States of Matter on Pinterest. We just watched Squibs by Ignite "In Matter: Atoms, Elements, and Chemistry" which explained Charles' Law and Boyle's Law. It might be worth checking out! This is a great visual experiment! I should try it with my kids.